Shaolin Weng Chun Kung Fu is a practical self defence system, which is based on realising your full potential as a human being, starting with developing your natural physical intelligence and mastering your own physical space through movement. Doing that, however, necessarily also involves psychological and spiritual self-awareness. 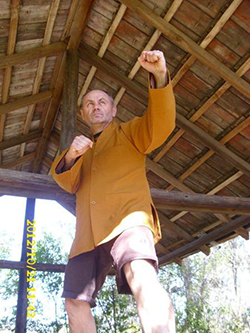 A dynamic and holistic system, Weng Chun Kung Fu shapes both body and mind. It embraces not only the Martial Arts but Shaolin Chan philosophy, Chi Qong for health, and conditioning exercises.